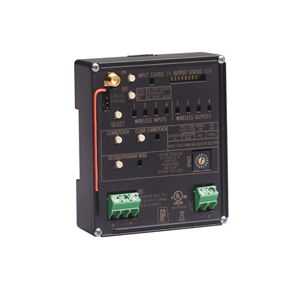 The Elaho-Echoflex Interface allows for wireless communication between Elaho and Echoflex control systems. When it's not practical to run wires between every device in your building's control system, the Elaho-Echoflex Interface is the solution. Using the built-in 902 MHz radio the Elaho-Echoflex Interface can transmit wireless signals to any Echoflex control device within 80 feet. And since the Elaho-Echoflex Interface is a DIN-rail-mount device, you can install it nearly anywhere. With four inputs and outputs, it's easy to expand your system with the Elaho-Echoflex Interface. Control your Elaho presets and zone levels by linking Echoflex devices -- including Keycard and Wave Stations, and Occupancy/Vacancy Sensors -- to Elaho-Echoflex Interface input. Or you can control Echoflex power controllers such as Relay and Split Duplex Controllers or Phase-Adaptive Dimmers from your Elaho system.